this week, we'll be treated to the smooth, orchestral lounge stylings of rungruedi phaengphongsai! rungruedi was born in bangkok and enjoyed a privileged upbringing; at age 19 her parents sent her to live with the suntaraphon big band, to pursue her love of singing. she excelled in the group, and was set to be the leading lady of suntaraphon's 70's incarnation, but after 3 years singing with the group, rungruedi decided to strike out on her own. she became a fixture in bangkok's nightclub scene, and took to singing enka & otherwise japanese-themed material for the benefit of foreign clientele. this tape features some excellently produced, string & horn-infused schmaltz, with flourishes of thai & japanese folk sounds. her little dog, unfortunately, makes no contribution. enjoy!! So, Thailand DOES export cheese! luk krung tend to be a little too schmaltzy for my tastes, at least in large doses, but this one was lovely. Hello, monrakplengthai. Thank you very much for your effort and care on sharing the great music you like. I have been in Thailand and it is a great place, the people are as nice and beautiful as their music. I will never foget the Ping Pong Show, were girlz naked on a boxing ring spit ping pong balls outa their cuntz to the public. Also I bought "tchaka tchaks(?)" an insect mutation on where their organs grow out of their bodies kept by honey. Really enjoyed the Banleng Ponglang tape, thanks for that and the many more good tapes ill be finding here. Thaaanks. Hi monrakplengthai, thank you so much for the music you share here. My mother is from Thailand but live in Sweden. 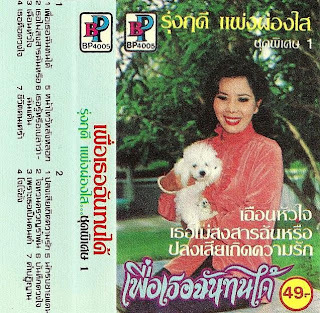 She always tell me that I should try to find some of the old thai music online so I was very happy to find this blog. Thanks for this. I've been mining in your archives, and I'm loving the luks krung & thung. I've spent ages tryng to track down a soundtrack album to the movie 'Cherm' to no avail - some of this music gives me the same feeling. My wife says double thanks 'cos see recognizes a lot of it form her childhood and youth. Dear monrakplengthai, your blog is amazing! I could recently hear a great inspiring song from this album on youtube but I can't find any info on it online. I was wondering if I could get a re-upload of the album since the Mediafire link doesn't work anymore?